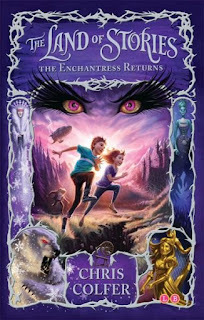 The Land of Stories, Book 2: The Enchantress Returns sees twins Alex and Conner another year older and getting on with their lives in the normal world, despite (worringly) not having heard any news from the Fairy Tale Land in that time. When their Mother is kidnapped however, they once again find themselves drawn into the fairy tale world, though this time when they arrive it is to find all the kingdoms in turmoil and the people of the lands living in fear. Rumpelstiltskin has been broken out of prison and rejoined his old partner in crime, Cinderella's baby daughter has been snatched from her bed, and wild vines have all but destroyed Sleeping Beauty's kingdom - all events that herald the return of the long ago banished Evil Enchantress. Alex and Conner team up with their friends to find a way to beat the Evil Enchantress, setting out on a quest to gather all the items they require to create the Wand of Wonderment - a legendary wand that is their only hope of winning against such a powerful nemesis. Despite this story line being extremely similar to that of the first book in the series (a quest for objects that will activate magic and overthrown an evil and unbalanced woman), this book still manages to stand on its own two feet. As they navigate and explore different areas of the kingdoms and get to know their fairy tale character friends more intimately, particularly Jack (as in 'and the Beanstalk'), Goldilocks, Red (as in 'Riding Hood') and one of the Prince Charming brothers, the twins discover more of the history of the Land of Stories, and it is this development of the back stories that really shines in this series. Colfer's writing has improved since the first book in the series, but it is his ideas and the twists and turns that he weaves through the well know traditional fairy tales, truly making them into his owns stories, that has me coming back for more. For a review of the first book in the series, click here.